What? 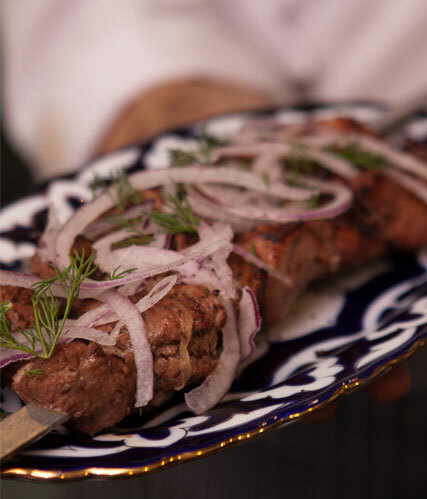 Seriously smart central Asian eats in the heart of central London. The vibe: Populated by oh-so-smart locals, a fashionable after work crowd and a smattering of shoppers wandering off the beaten track, it’s fast becoming the hottest new place in Marylebone. 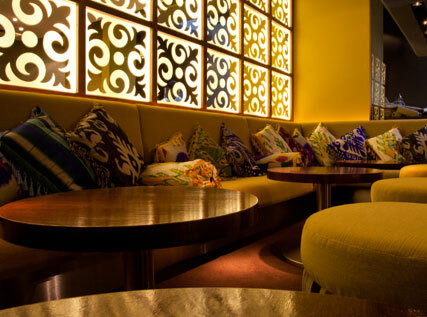 The dining room is simple – sleekly set tables with high backed chairs – while the banquette-packed lounge is perfect for gossiping over cocktails. Sounds interesting… It is! If, like us, you’ve never sampled the delights of Uzbekh, Kazakh or Turkmeni cuisine, now is definitely the time to try. Think hearty winter fare – samosas, steamed dumplings and succulently baked lamb. If I’m feeling adventurous? The Besh Barmak – delicate handmade pasta sheets, with meat broth and sharp salt beef – was filling, delicious and very different to anything we’ve had before, and for us, the Aubergine Caviar was a must. And for the conservative diners among us? There’s something for almost anyone. The traditional Manty – steamed dumplings stuffed with melt-in-the-mouth lamb and a tangy yoghurt dressing – rocketed to the top of our list from the first mouthful, while the stewed succulent lamb served with thyme new potatoes was fairly plain, but perfect for less adventurous eaters. What’s good to drink? We washed our meal down with a crisp glass of white, but could easily have been tempted by the cocktail menu – you just can’t go wrong with their classic Bellini. All in all? Definitely worth a visit. With mains ranging from £10-14 (minus sides), it’s perfect for evening cocktails, or a mid-week treat.